Expedition 25 Flight Engineers Oleg Skripochka (left) and Fyodor Yurchikhin, both Russian cosmonauts, work outside the International Space Station during a Nov. 15, 2010 spacewalk that lasted about six hours. Two spacewalking cosmonauts ventured outside the InternationalSpace Station today (Nov. 15) and sped through a veritable laundry list of orbitalmaintenance jobs, with only a stubborn TV camera preventing them fromcompleting their work. Veteran spacewalker Fyodor Yurchikhin and first-timer OlegSkripochka, both of Russia's Federal Space Agency, spent about six and a half hoursfloating outside the spacestation to install a new staging ground for future spacewalkingcrews along with several other maintenance tasks. Russian mission controllers decided to postpone that jobfor a later spacewalk since the cosmonauts were running out of time and neededto go back inside. "Now we have a clear understanding of what is goingto be done next," Mission Control radioed. 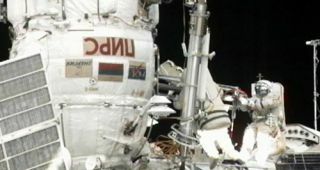 Another minor hiccup came earlier in the Russian-managedspacewalk when the cosmonauts saw an object floating away and worried thata tool may have escaped in space. They will have to double check their toolbags to make sure they have everything. If an item isn't secured at all timesto a spacewalker or the spacecraft, it can easily get lost in microgravity. Despite starting about a 30 minutes late, at around 9:53a.m. EDT (1453 GMT), Yurchikhin and Skripochka worked at breakneck pace and wereoften ahead of schedule. In fact, the spacewalkers were speeding through theirwork so fast that at one point mission controllers had to force them to take abreak. When Skripochka appeared overeager to continue working,Mission Control radioed, "We asked you not to work. I can see how he'smoving to the handrail. Oleg, you have to stop, you have to rest." Yet that was easier said than done. "It is not as easy as it seems to be," Skripochkasaid, complaining that it was tough to be still. "I think I'll get cold ifI stay without movement any longer." Altogether, the spacewalkers completed a bevy of tasks,including installing the new workstation designed to aid in futuremaintenance work, removing an old experiment to test an Internet-based controlsystem for the station's robotic arm, and collecting samples from theinsulation of an oxygen-generation machine to look for signs of microorganismsthere.They also attached a new science experiment to test the effects of the spaceenvironment on a series of materials.